Please see some ideas for fundraising below and also see our page of current events. There is a one in 14,450,000 chance of winning the lottery, BUT there is a one in 180 chance of a child having a heart condition. So a lot of parents need support – and this is where you can help: parents need to know about Heartline in those crucial first months after they find out their child has a heart condition, when you can feel so uncertain and alone. Then we can keep in touch with them as their child and they deal with whatever comes their way, and support them. You may have your own story to tell – we can put your story on this website if you think it will help others, and will allow us to do so. Lots of local groups are looking for interesting speakers, and Heartline can provide you with a short power point presentation, and/or leaflets and posters and magazines to help you on your way. Colleges offering child development or nursing courses are always looking for projects to offer students – get in touch and ask if they would like material. Schools and employers would also be interested – a talk for Valentine’s Day (World Congenital Heart Disorder Day), or to persuade a school to make Heartline their Charity of the Year. Your local newspaper, radio station, hospital, Sure Start centre, Health Centre would benefit from a Heartline magazine, poster, or leaflet. If you have a story that could be of use to other families – about how well your child is doing, or how much help you had from your community, or how you overcame the problems of caring and working – someone will be interested in it and want to print it as well as us putting it on the website. And if you are on Facebook, or Twitter or other social network, remember that at some time nearly everyone will have a friend who has just learnt their child has a heart problem, and need somewhere to turn. Our Face Book page is Heartline FB page. A Family with a child with a heart condition can join Heartline via Register with Heartline and then have access to our Services. Hundreds of children and families benefit from the work of Heartline Families every year. Your donation can help to ensure that we can continue to give them the benefits we are currently providing and more. We need to raise £50,000 per annum to provide the family support (this takes funds, even without any office costs, which is a ‘hidden cost’ not often considered, but probably our most valuable service), wetsuits, caravan holidays, supervised activity holidays and other information and benefits for heart children and their families. Heartline needs funds for hospital information and (our award winning) dental leaflet packs for new Families, printing Heart Children books for Families, PGL activity breaks for heart children and for their brothers and sisters, maintaining our caravans for much needed family holidays, editing our Newsletters to provide information and contacts, and many other services. Don’t forget about us whenever you are shopping online. If you go to this link, every time you buy cards you are helping Heartline raise funds for our services. You can purchase cards for all kinds of celebration – Easter, Birthdays, and Christmas – online at Greetings Cards Link. It is easy, you just click on the link, select the cards you want and as you go through the payment process you select Heartline. Greetings Cards keep an account of transactions on our account and send us payment on a periodic basis. Denise has tested the link and it works properly (I’ve bought some Christmas cards as early as October as a result!! ), but please email Denise on Denise if you encounter any problems. Thank you so much for using this service to buy your cards and benefit Heartline. Virgin Money Giving and JustGiving are easy ways for you to fundraise for Heartline. You will need to think of a fundraising activity or event which you would like to organise, then simply set up your own page on your chosen site. It allows you to refer supporters to your page and your event so they can support you online, and the donations are then remitted to Heartline on a periodic basis with Giftaid accounted for. Remember you will need to promote your event with your family, friends and work colleagues. The more people you tell the more successful you will be. We are very grateful to our long time supporters who have used Virgin Money Giving and Just Giving to make a commitment to raising funds for Heartline. You can find the Heartline Virgin Money Giving page at the following link: VirginMoneyGiving and select Heartline as your chosen charity. Legacy Funding – Thinking of Drawing up a Will? Heartline supports children with heart disorders and their families, whatever the condition, wherever it is treated. 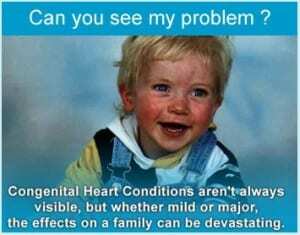 Regrettably, in the UK one baby in every 180 is born with a heart disorder and more acquire them in childhood. For parents, the stress of finding out that a child has a heart condition – quite often before the baby is born, sometimes after a struggle to get health problems diagnosed, or at a later stage as a result of another illness – means support from someone who has been through the same experience can significantly ease the stress and reduce the feeling of isolation. Heartline Families is there for them, to offer support for the child and their family. Heartline provides support through both a public and a private Facebook Forum for parents to discuss issues privately, on this website. We also supply a comprehensive handbook ‘Heart Children’ and leaflets for children and parents, including our award-winning Dental Care leaflet. To encourage independence and allow children to take part in regular family and school activities we offer wetsuits, activity weekends and caravan holidays. Heartline also offers bereaved families a place to remember their child in the Heart of Stars constellation. Information and contact with registered families is provided and maintained through social media, newsletters and an annual review, so that we may be there for them throughout the childhood of their Heart Child. A gift in a will to Heartline Families will help future generations of Heart Children all over the UK to get the best from family and school life; to reassure their parents that they are not alone in dealing with the stress of a child diagnosed with a heart condition, along with the care, sorrow and joy that entails. Heartline is honoured to have many Families who raise funding in memory of a loved and lost child. The Theo Walker Fund have been fundraising for Heart Children for many years in memory of Theo, holding challenges, sponsored walks and tennis tournaments to get together and remember Theo at the same time as helping other children with a heart condition. The McKain Family through Sarah’s Star Fund have raised funds to assist in the running of the caravan holidays for Heart Families at Oakdene in Hampshire and Mablethorpe in Lincolnshire and are committed to making sure we can keep this facility going now we have a new caravan on each site. With your help collection boxes can raise us a lot of valuable income. Small amounts from many collectors add up to a lot. for the amount you have saved up. Clearly mark the transfer or cheque with your name, box number and “Coll Box Donation”. Contact fundraising@heartline.org.uk and we will send you a Giftaid form at the same time. We can send you collection boxes for your fundraising event or to place on an agreed site. We need to record where the sealed boxes are placed and to follow a simple procedure to oversee the collection and banking of the proceeds, issuing a receipt and thank you to the siteholder, as required. Please contact Denise on denise.hadow@heartline.org.uk and we will arrange for sealed and numbered boxes to be sent to you and to register the necessary details on our records. This is straightforward to do and we will follow up at an agreed or appropriate time. Good Luck and Thank You for your help. Do you know about Payroll Giving? Payroll Giving is one of the most valuable ways you can support Heartline. Regular gifts provide security for the future supply of our benefits to heart children. Heartline relies on regular donations to keep vital information up to date and reaching those who need it. For employers it is a convenient way to enable their employees to support charities. For employees it is a way to give more as it is taken from gross pay. This means that a donation of £10 would cost an employee £8 as the donation is taken from pay before tax. If your company does not have a Payroll Giving Scheme at present, it is easy to set up. We can send you or your payroll department information on how to do this. You can set up a payroll donation by completing our Payroll Giving Form. We can send the Form by email or post if you email denise.hadow@heartline.org.uk requesting the form and giving your postal address if you wish it to be sent by post. As well as for specific projects, we also need help with core funding. This is money needed to run the charity from day to day – website, telephone, stationery, communications, medical publications and facts sheets and services such as our Heartline magazine. Additionally, employees can nominate Heartline under their company’s Payroll Giving Scheme. We will provide a Payroll Giving Form and more advice will be available shortly to make this easy for you to set up. Some companies will allow employees to take some working time to volunteer on behalf of their chosen charity or even donate based on the number of hours volunteered. Please do ask them if they have this type of scheme if you would like to volunteer for Heartline. Thanks to all our supporters who donate time and money to allow Heartline to provide ongoing support to families with children with heart disorders, whatever the condition, wherever it is treated. Many of you are trying to do a full time job, care for children, and often sick children and many other things and yet you manage to find time to raise money for Heartline as well. James is organising a Walk in the Light Concert in Reading; Nicola has raised sponsorship to provide new bedding for the Mablethorpe caravan; Kelly’s daughter’s school is having a wear red fundraising day; and many, many more… We have grants from some wonderful trust funds and regular donors, too many to mention individually, for which we are continually grateful. Thanks to them we are able to raise money towards replacing our holiday caravan at Oakdene (that gives families with a heart child a much needed break) without affecting our other services. Thank You. Thanks to the McKain family for their generous donation of £2,500 on behalf of Sarah’s Star Fund towards the running costs of the caravan holidays, we started the 2015 caravan year knowing we could afford to ask the site to fix maintenance issues and keep the caravans working without thinking twice about whether we do so or need to find a volunteer to go in and help us out. Thank you to Hannah and Anne. The photo below is of Sarah and we have placed a plaque in the caravan to say thank you. Looking back to August 2014 it would not have entered my wildest dreams that we would have raised sufficient funds to replace BOTH our caravans. BUT we have done it. Members of the ex-100 Club! For me it has been a learning experience and a sometimes bumpy ride with moments of dismay (the grantor said no!) and others of elation (they said yes! ), and sheer human gratitude to those who have rescued me from near disaster once the caravan was purchased but not ready to use. I get on the ‘phone to all involved, the confused family on site wondering what on earth we let them in for, the site reception, site managers, everyone who needed to know and might be able to solve the mystery. It turned out that the site had mistakenly got the old caravan towed away, contents inside, including our much valued Visitor Books! After a few minutes of ‘this cannot be happening’ and having grasped an understanding of the miscommunication that had given rise to the lack of caravan, the site management, in the person of Liam McCarthy, leapt in to action and has been unerringly helpful ever since. First they got the Heartline visitors housed in another caravan and able to enjoy their week. Then Liam set about getting the replacement caravan on site and, having established that the contents were gone for good, the management agreed to replace the lot, for which we say thanks. Liam spent many hours ensuring it was habitable. Thank you, Liam. The first family to use the caravan, the Coopers, kindly donated some things which were missing including the all-important, brand new, Visitor Book. I went down the following Saturday to visit and found Caroline Mutton and Wendy Lynch set up in the caravan. They kindly offered me a cup of tea and we had a chat while waiting for Liam who came over to assess what still needed to be done. Having sorted out the major issue of the ramp re-fixing, Caroline and Wendy kindly agreed to get some of the contents which were needed. Below you can see a picture of Max, Maisy (Wendy’s heart children) and Oli (Caroline’s heart child) all standing outside our lovely Heartline caravan. Thank you for letting me visit and meet you, and thank you for your ongoing help with the contents and cleanliness of the caravan.